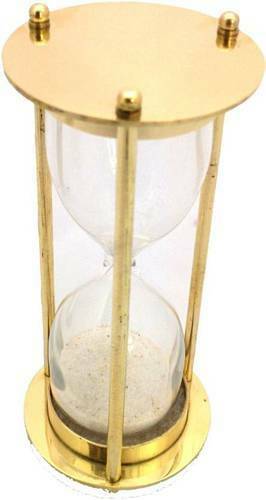 Leading Wholesale Trader of 5 Minute Antique Brass Hourglass Decorative Showpiece - 6 Inches Height (Brass, Gold) and Brass Gift Center Sand Timer Dipped from Saharanpur. The gift piece has been prepared by the H.H Traders of Saharanpur. Disclaimer: The item being handmade; the fine design, pattern and color tone of the product may vary slightly from that shown in the image. However, there would not be any compromise in quality.